The truth is that there is nothing good about calluses. They are unpleasant, look bad, and they can be severely painful. Even though they can appear in different parts of your feet, one of the worst parts in at the bottom of foot. After all, this increases the pressure and pain you feel during the entire day. So, how to remove calluses from bottom of feet? When you’re not sure if you have a callus on bottom of foot, just take a look at it. If your skin is yellowish and thicker, you most probably have a callus on bottom of foot. This is just the result of the repeated pressure or friction in this part of your foot. Even though calluses look terrible, it is our own body that develops them to make sure that our skin tissues remain intact. In addition to the callus itself, you may also notice some other things on your foot. This may include corns on bottom of feet, as well as cracked and dry heels. All these signs can be more evident if you tend to spend a lot of time wearing uncomfortable shoes, walking or running. While most people tend to experience calluses on the feet, they can also develop on your knees, hands, among other areas of your body. In case you have some difficulties distinguishing calluses from corns, a corn tends to have a hard center that is surrounded by inflamed skin and it is usually smaller than the callus. What causes hard callus on bottom of foot? wearing high-heels is one of them. The truth is that when you wear this kind of shoe, your feet are constantly flexed and they put a lot of pressure in just one area no matter if you’re just standing or if you’re walking. wearing shoes that don’t fit your needs. Either when the shoes are too tight or too loose, when they don’t have a good toe area, they might be causing a lot of the calluses that you have been experiencing. when you have some foot deformities such as foot or heel spurs, hammertoes, cavus foot, clubfoot, or flatfoot. in case you like to walk barefoot especially on hard surfaces. bad posture can definitely lead to callus and corns on bottom of feet. wear comfortable and fit footwear. identify what is causing the friction and implement the necessary changes. make sure that your feet get the rest they need. keep your feet both cleaned and moisturized. Read more about how to choose shoes to prevent calluses. In case we lived in a perfect world, all we needed to do was to apply the advice we made here to prevent calluses from appearing and we were good to go. However, most people already have them. You included. So, how to remove calluses from bottom of feet? As you probably know, there are multiple ways to remove calluses from bottom of feet. However, the problem with most of these possibilities is that they just take too much time and the end result may not be what you would want. So, one of the best ways to remove calluses of feet is to use an electric callus remover and shaver. While there are multiple products, the one that we refer is the Rechargeable Electric Callus Remover and Shaver. What we really like about the Rechargeable Electric Callus Remover and Shaver is that it seems that you just went to a professional pedicure without even leaving your home. The results are absolutely amazing. After all, your feet will look more beautiful than ever – hydrated, without any calluses, and extremely smooth. The Rechargeable Electric Callus Remover and Shaver just got improved and it gives you 3 times more power to get rid of that dead skin once and for all. However, it will still protect your skin from irritation and cuts due to the use of their pressure-sensitive technology. One of the things that we like about the Rechargeable Electric Callus Remover and Shaver is that you don’t need to keep it plugged in while you’re using it, unlike other electric callus shavers and removers. With a simple charge, you can use it multiple times. The Rechargeable Electric Callus Remover and Shaver is simply perfect since it features an ergonomic design as well as it is lightweight. So, in case you need to travel and you need to ensure that your feet look amazing, you can easily carry it with you. One of the things that you will love to know is that the roller head is not only refilled as it is made of quartz micro mineral crystals that are made to last for a very long time. In case you decide to try it out, the package comes with the Rechargeable Electric Callus Remover and Shaver, a dual voltage international charger 110-240V, a protective cover, 2 extra mineral rollers – one coarse and one regular, a cleaning brush, a support card, and a user manual. While some people seem to have no problems with using an electric callus remover and shaver, you may prefer other options that don’t involve cutting. In that case, one of the best things you can do is to use the Be Natural Callus Eliminator Bundle: Callus Eliminator and Dry Heel Eliminator. 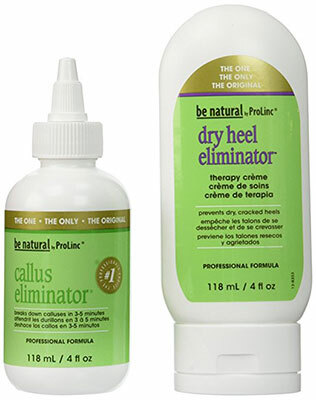 When you are looking for an efficient and professional way to remove hard callus on bottom of feet, the Be Natural Callus Eliminator Bundle: Callus Eliminator and Dry Heel Eliminator might be the perfect solution. Even for the hardest calluses. The Be Natural Callus Eliminator Bundle: Callus Eliminator and Dry Heel Eliminator will break down the calluses unsightly in 3 to 5 minutes. Then, you will just need to buff or file them away. 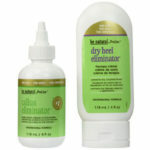 After this simple process, just use the Dry Heel Eliminator to repair, nourish, and hydrate your skin. Filled with powerful oils and vitamins, this cream will be quickly absorbed by your skin allowing it to soothe, hydrate, and heal. If you are one of the many people who prefer a natural remedy or solution to remove callus on bottom of foot, then you should try to use apple cider vinegar. In case you don’t know, apple cider vinegar is known to be a powerful health tonic that is very effective when you’re trying to remove both calluses and corns. The hard job is done by the acid nature of this product that will break down the hard skin. 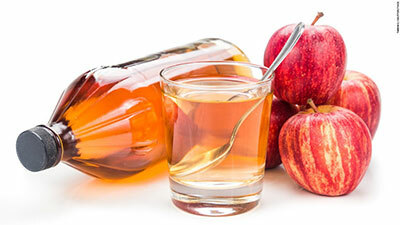 In order to apply the apple cider vinegar, you just need the apple cider vinegar (exfoliant) and medical tape. You can then soak a cotton ball in apple cider vinegar and just place it on the callus or corn. Make sure that you secure the cotton ball with some medical tape and leave it during the night. When you wake up in the next morning, use a pumice stone to remove the dead skin. You should repeat this treatment until the callus or corn disappears. 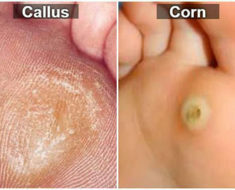 Usually, it tends to last for about 1 week but it depends on the severity of the callus or corn that you are treating. 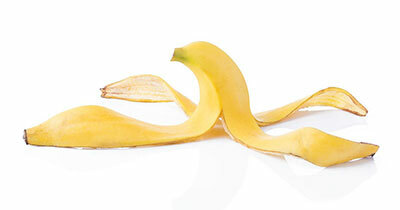 If there is something that you probably never imagined using in your callus is a banana peel. However, banana peels are high in potassium, lutein, and salicylic acid. All these nutrients put together work very well not only to remove calluses as well as they can also prevent further skin problems. All you need to do is to cover your callus with the inside of the banana peel. Just put on a sock and leave it for the night. In case you don’t want to, you can also use the inside of the banana peel and rub it over your callus multiple times throughout the day. Make sure that you repeat the treatment until the callus is removed. It usually takes about one week. Discover everything you need to know about calluses and corns. Last but not least, another powerful way on how to remove calluses from bottom of feet includes the use of Epsom salt and a pumice stone. Epsom salt tends to be very used since it features sulfate and magnesium which help soften the skin. In addition, Epsom salt is also a powerful anti-inflammatory which can help cure foot infections. In order to start the treatment, you need 3 to 4 tablespoons of Epsom salt, 1 quart of lukewarm water, a pumice stone, and a foot tub or sink. Just put the water and the Epsom salt in the tub and stir until the salt is completely dissolved. Then, soak your feet for about 30 minutes. In case the water starts to get cold, you can always add more warm water. Then, gently rub the callus with a pumice stone until the skin becomes soft. Rinse your feet with the water and dry with a towel. Then, just make sure that you apply a moisturizer to ensure that your skin is hydrated.